Hope you all have a good start into the week and thanks a million for visiting! Non sai quanto mi piace il top!!!! Lo voglio!!! E poi belli anche gli zoccoli in legno! HI Lilli, I like your lace shorts. I also bought a navy blue lace shorts for this summer. It's my favourite to wear. Your clogs are so stylish. Molto bello, stai benissimo e stupendi gli accessori! Più trendy di così... impossibile!!! Bellissimo il top Lilli! I swear no one does boho chic better than you Lilli! That tassel top is super chic and adorable at the same time and the way you styled this look is just perfect! Happy Monday my dear! This is a version lovely Look dear Lilli. The trassels are very cute and this the Shorts and clocks a perfect summer outfit. You look also pretty with the headband. The necklace is a nice trend and remind me of the 90ies. 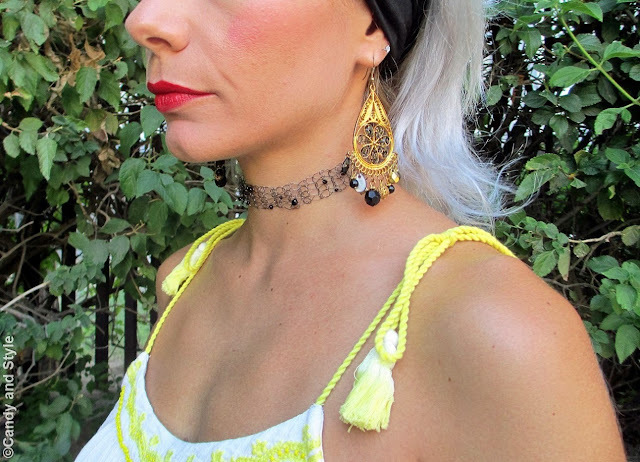 Bellissima Lilly, adoro gli accessori. Favolosi i tuoi shorts Lilli, bellissima e super estiva, un bacione ! Hi Lilli, I like the proposal, cool and comfortable my favorite items are the shorts and the sandals, you look fantastic as usual! Kisses dear. Love the cute shorts and the headband! A very glam and original look. Have a great Tuesday. You look so effortlessly chic, Lilli! I am amazed at how well you wear those clogs, I have tried them before but they didn't look half as good on me.